A square in the liberated city of Minbic. Picture by Ercan Ayboga.It is getting more and more complicated here. Almost all parties at war are located in close proximity to this region in Northern Syria. Most notably the Turkish army, acting as an occupant, wants to take Minbic – an endeavour which, although announced by Turkish president Erdoğan, has so far failed due to the resistance of the local population, as well as the US and Russia. The city of Minbic was liberated on August 12, 2016 by the Syrian Democratic Forces (SDF, arabic: QSD), thus ending the "Islamic State's" (ISIS) rule of more than two and half years. Shortly before the liberation offensive started, the Minbic Military Council had been set up on May 31, 2016 by the QSD under the leadership of the Kurdish People's and Women's Defense Units (YPG/YPJ). It exercises military control over the Minbic region, located about 100 kilometres southwest of Kobanê, which became known worldwide for its resistance. In autumn 2016, the Military Council handed over the region's administration to the provisional Minbic Civic Council. Consisting of Arabs, Kurds, Turkmens and Circassians, the Civic Council has renamed itself the Minbic Democratic Civilian Administration Council on March 12, 2017 and expanded in size in order to heighten its democratic legitimation. The significance of Minbic derives not only from its geostrategic location in the Syrian context, but also from the political system which has been established there from August 2016, namely with the Minbic Democratic Civilian Administration Council which holds a very high democratic standard and is supposed to serve as a model for a new democratic Syria. This will be the focus of this interview which was conducted with the key representatives of the Democratic Administration's legislative, among them the co-chairs Sozdar Xalit (Kurd) und Faruk Maschi (Arab), as well as Emel Bozgeyik (Turkmen), Muhamed Dolmusch (Turkmen), Muhamed Tarik (Circassian) und Abdo Mustafa (Kurd). What kind of a city was Minbic before the war in Syria? All: Until 2011, about eighty percent of Minbic's population of roughly 100,000 were Arabs. However, more than ninety years ago the majority of the population had been Circassian. Shortly before the ongoing war, Kurds made up close to 15 percent, while Circassians and Turkmens together accounted for only about five percent of the overall population in Minbic. Several decades ago a small Armenian community had existed as well, which emigrated to Aleppo though. Both commerce and agriculture have always been well developed in Minbic. Economically the city was in quite a good shape. The level of education is quite high as compared to the surrounding areas. Maschi: The region's 63 Arabic tribes convened regularly for many years and came to terms with the state, but in general did not actively support it. The two biggest tribes sent one deputy respectively to the Syrian parliament. What was the period between the beginning of the Syrian uprising and war until shortly before ISIS' rule like in Minbic? All: The city of Minbic and its surroundings positioned themselves quickly against the Baath regime from spring 2011 onwards. But there were heated discussions on whether resistance should be peaceful or armed. Members of the Democratic Self Government. Picture by Ercan Ayboga. Dolmusch: This discussion was held among Arabs as well as Turkmens. While the latter organised themselves peacefully initially, a lot of them quickly changed their mind when weapons, money and military training was pressed on by Turkey. Thus the Turkmen society was of two opinions. Maschi: I, together with my tribe positioned myself against the regime, but rejected armed aggression. But many were in favour of them and the Arabs were of divided opinions. Hardly anyone was on the side of the regime. All: From 2011, up to 76 oppositional military brigades formed quickly, all convening under the label of the Free Syrian Army (FSA). Politically, the Kurds got organised mostly in the Movement for a Democratic Society (TEV-DEM), an alliance of several Kurdish parties including the Democratic Union Party (PYD), which quickly rose to be the major force of Kurds throughout Syria. On the military level, they assembled mostly under the Al-Akrad group, which belonged to the more progressive parts of the FSA and was on friendly terms with the YPG/YPJ. FSA rule in Minbic from July 2012 at first led to more political freedom but it was a very chaotic period. Most FSA fighters on the one hand could not cope with basic administrative tasks and on the other they began to enrich themselves. Having plundered state institutions, they robbed civilians. After a few months the FSA turned more repressive and started to fight among each other. The population became dissatisfied. It was quite easy for the Al-Nusra Front, the Syrian Al-Qaida which was growing in strength, to seize power in spring 2013. Right at the beginning, Al-Nusra introduced sharia law and exerted greater political pressure. Many people who were accused of criminal acts got their hand chopped off. Theft, too, was part of Al-Nusra fighters methods. While the FSA curtailed TEV-DEM's political work in the villages, Al-Nusra began to oppress TEV-DEM in the city as well. In short, Al-Nusra's short rule was far from social justice and freedom and was heading speedily towards dictatorship and chaos. Thus, ISIS with it's assertion of absolute Islam and a just system encountered no difficulties in grabbing the power in Minbic. Hotel where ISIS tortured people. Picture by Ercan Ayboga. How can we imagine ISIS' rule in Minbic, which lasted about three years, to be like in practise? All: When the regime was ousted in 2012 the population of Minbic rose in number at first. But with ISIS, it shrank to less than half of the original number. Notably almost all Kurds and Circassians left the city because they were seen as potential enemies. Dolmusch: When ISIS ruled in Minbic, they were not so much after Turkmens, but in particular after Kurds. Because they feared them a lot. All: In the first months, ISIS conducted themselves quite cautiously in the city. They even offered sweets to children on the streets. But right at the beginning they underlined what is "halal" (permitted) and "haram" (prohibited). The population watched ISIS rule passively at first. But a few months later ISIS showed its true face and started to control political, social, cultural and economic life in a formerly unknown way. Any kind of objection to or infringement of the rules imposed by them were met in the most brutal way. The most extreme form of terror perpetrated by ISIS in Minbic was to lock up people – 545 persons in the course of about 3 years – in cages put up on public places for days, not allowing relatives to come to them, and behead them in public days later, with many people being made to attend by force. This was recorded on video in order to spread even more fear of ISIS. Bozgeyik and Xalit: Women and also girls were subjected to special laws. They had to wear the strictest type of chador in public and were only allowed to go out on the street when accompanied by a male relative, having to walk 15 metres behind him. In order to receive a punishment it was enough for a part of the woman's face to be seen outside. It sometimes happened that men lost sight of their wives or sisters and were not able to find them again. Many women simply stayed at home all the time because of this regulation. Some women had to continue working in the vegetable fields around the city due to the difficult economic situation, a job greatly obstructed by the chador, especially during summer. Certain products such as tomatoes, tinned food or other things especially favoured by women, were banned. In order to enforce restrictions more efficiently, even a women's militia was formed. Arrested women were tortured – shortly after liberation traces of blood were seen in the women's jail – and in many cases stoned to death in three public places. We are particularly pleased that a tree has grown in exactly one of these places. Women going to attend a demonstration. Picture by Ercan Ayboga. All: Under ISIS the economic situation in Minbic grew even more difficult and life exceptionally expensive. They sold bread and one litre of Diesel for 350 Syrian lira respectively (the price of which was only about 40-50 lira in YPG-/YPJ-/QSD-controlled area at that time) [equivalent to roughly 1,50 and 0,20 EUR]. Often, long queues formed at the distribution points, although petroleum and crop were available in sufficient quantity in ISIS territory. Sugar was very expensive, too, although it was produced in close-by Maskanah. Horrendous taxes were randomly exacted from shop owners and merchants. ISIS financed their war this way. The foodstuffs available were rationed, with ISIS fighters withholding the best parts for themselves, justifying this with their alleged status as "God's warriors". Most people survived on money which came from relatives living outside. The poorest, who asked for financial support, generally were told to join ISIS as fighters. All schools in Minbic were closed by ISIS, our children could only attend Islamic schools. When ISIS had enlarged their capacity of own schools after some time they started to force all children into these schools. There they were subjected to ideological brainwashing and pressure to join ISIS from a young age. There were so many more crazy bans as for example, eating in parks. Using a mobile phone was prohibited in general. If someone was caught for the first time, they had to pay a high fine. In case of repetition jail and torture loomed. Not everything which ISIS did can be linked to Islam. They instrumentalised it for their regime of terror. According to your account ISIS was not supported by the population. But were there not many people who actively supported them? This was the case only for a small part of the population, most of those who remained adjusted themselves. We have to keep in mind that more than half of the population fled from Minbic when ISIS ruled. But sadly so we have to say: Some families positively sold their daughters to ISIS, partly for ideological and partly for financial reasons. If you were close to ISIS and acted as an agent you were for example allowed to work in one of the many small Diesel refineries. Some became agents, we were scared not only on the street but also in our staircase. The majority of the population positioned themselves more and more explicitly against ISIS from 2015. All in all three demonstrations against ISIS' methods took place in Minbic, once even shops were closed. But all attempts were suppressed in the most brutal ways. Minbic is one of the few cities controlled by ISIS where demonstrations against their methods took place at all. Support for ISIS was bigger among the armed groups than the civilians. Unfortunately, an important part of the former FSA joined ISIS militarily from 2014. Shortly before the liberation operation started on May 31, the Minbic Civic and Military Council were proclaimed. How did this come to be? Xalit: The liberation of the Tishrin dam on the Euphrates through the QSD in December 2015 slowly raised hopes that ISIS could lose its sovereignty over the Minbic region. ISIS slowly lost its confidence and rightly so. 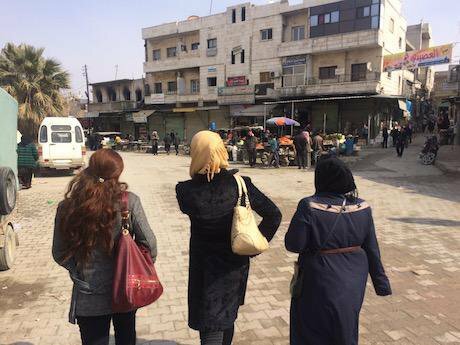 Because in the beginning of 2016, people and groups who had fled Minbic convened with YPG/YPJ/QSD and representatives of the three Rojava cantons and the newly founded Syrian Democratic Council to prepare the liberation of Minbic. The former TEV-DEM activists from Minbic were the motor of this enterprise. Since we both had fled from Minbic before, we contributed a lot from the start. First, the Minbic Military Council was founded in the beginning of 2016, and then the Minbic Civic Council on April 5, 2016. The representation of all parts of society was so important to us that we reserved the seats for Circassians in the 43 members strong Civic Council. Because almost all of them had been forced to leave Minbic. The Civic Council used all the languages spoken in minbic right from the start, the banners were in four languages. The Military Council had women as members from the start, we made this a point. However, they were hardly present in the media at the time of the liberation operation. Maschi: It was possible to proclaim both so swiftly because of the terror perpetrated by ISIS which was of utmost brutality and the hate against it on the one hand, and the active support of both structures by the QSD and the Syrian Democratic Council on the other. I myself have had a good relationship with the Kurds in Minbic and close-by Kobanê for a long time. I have always valued having actual deeper relations with them as an important goal, only then can we prevent other forces from playing us off against each other. I also convinced many people in my Al-Buberne-Clan, which is one of the biggest clans in the Minbic region, of that. The Minbic Civic Council and the Military Council which possesses an autonomous structure within the QSD, and the civil council have collaborated closely right from the start, the task sharing was quite good. This became apparent during the liberation operation which lasted about three months. The Military Council grew quickly during this operation and reached several thousand members when Minbic was liberated. One of the partly destroyed neighborhoods in Minbic. Picture by Ercan Ayboga. What did you do as Civic Council, when the Minbic Military Council had started the liberation operation? Xalit and Maschi: Before and during the liberation operation we made great efforts to get in touch with people in Minbic and refugees from Minbic in various places and win them over for the liberation. The acceptance of the Civic Council grew fast through this, which was of importance for the time after liberation – we were confident of the success of the operation. We had formed groups which, starting from June 2016, immediately visited the liberated villages and informed about our goals and intentions. The vast majority received us with joy and relief. Apart from that we, together with volunteers, tended to the many hundreds wounded in the course of the hard fights in Minbic. But most of all we led discussions on how the administration of the city and surrounding regions of Minbic should work. Every step during and shortly after the liberation was important to gain the support of the broad population. In fact we were all in all quite successful, and were given charge of leading Minbic for the transitional period without being questioned. From then on the population turned to us. Can you give us examples and impressions of how the population received the liberation? What was especially important for you? All: You can compare the liberation from ISIS by the Minbic Military Council and the Syrian Democratic Forces to the passage from hell to paradise! Accordingly, spirits were particularly euphoric during the first weeks. ISIS brutality had been so immense that many could rejoice only then when they could meet the Military Council and Democratic Forces fighters in person and not in combat position in front of their houses. Then came cries of joy. This great joy could be seen especially on women's faces. Many danced on the streets in the first days. It was important for us that no attempt at lynching took place. Tens of thousands returned to their houses within a few weeks, among them many thousands from Turkey. A lot of people approached us offering their help, or rather wanted to carry out tasks in reconstruction. The population had seen that we bring freedom and equality and do not want to exclude anyone or take advantage of differences in favour of a small circle. The population senses exactly this. Minbic has never lived through so much freedom in its history. The joy is still huge, everyone can see this for themselves walking through the streets of Minbic. People's faces are full of positive energy. Which were the first steps you undertook in Minbic? How has life developed in more than half a year? All: During the liberation process several dozens of buildings were destroyed completely, and hundreds of them partly. This is very little compared to many other Syrian cities which were fought over. One of the first steps was to clear the debris very quickly. Right from the start we made efforts to establish people's councils with broad participation from the population in every city district and every place outside of the city. In some places we quickly managed to build a democratic structure with women's participation. We are confident that we will manage to do the same everywhere within a short period of time. A second wave of happiness went through the region when schools reopened one month after liberation. They had been closed for three years. We had successfully called on all former teachers for that. The only change we have made to education so far is the abolition of the subject on state and history which used to be taught on the basis of Baath ideology. Kurds and Turkmens started to teach their children in their mother tongue additionally a few weeks after the opening. Tarik: As of now we are not able to offer our children Circassian language, which is also due to the fact that we do not speak our language very often. But with the new school term we will start. This is a huge challenge for us, because Circassian hasn’t been taught neither in Syria nor in Turkey. It is an incredibly wonderful feeling that everybody can go to school in their own language. All: When the situation in Minbic became more stable in autumn and we as Minbic Civil Council had organised ourselves better, administration was officially transferred to us by the Military Council. From then on, all important decisions regarding Minbic region were made by our council of 43 members. One of the first decisions was to ask the Military Council to build the security structure, called Asayîş. Economy was freed from the many restrictions imposed on it in the last years. This was important insofar as the merchants of Minbic were thus able to bring necessary goods from other regions. But this does not suffice by far and the traded goods are expensive in parts. But staple foods and other elementary goods and aids for the needy are coming from the cantons Kobanê and Cizîrê. Now bread – the large bread factory was restored immediately – and Diesel in Minbic cost the same as in Kobanê and Cizîrê, and water supply is working again. Electricity is delivered from Tishrin barrage almost all day long free of cost. Mobile company Syriatel was allowed to repair the telecommunication masts, and so people could talk to their relatives in other parts of the country again. The reconstructed bread factory. Picture by Ercan Ayboga. Some accused of spying for ISIS were given an open and democratic trial. But only after a people's court, transparent to the Civic Council and the public, had been established. But the liberation of Minbic has also led to people from regions where ISIS and other antidemocratic forces or regimes are in control coming to us as refugees. They say: “We have heard that there is freedom here, life is better and no one is persecuted. That is why we are here”. Of course we take them up but it's a huge technical and financial burden in our current condition to provide for additional tens of thousands of people. After Al-Bab was taken by the Turkish army and the regions south of Minbic by the Syrian army, further tens of thousands have come. Now at least there is a little international support. Recently, the Minbic Civic Council has restructured and renamed itself the Minbic Democratic Civilian Administration Council. Why, and what is different now? All: On March 12, 2017, Minbic Civic Council has not only renamed itself as the Minbic Democratic Civilian Administration Council, but also a number of restructuring measures in the entire administration have taken place after months of discussions. In the Civic Council, legislative and executive had been one structure, now they are separated. The number of representatives taking political decisions in the legislative of the Democratic Administration has been raised from 43 to 134. 71 of them are Arabs, 43 Kurds, 10 Turkmens, 8 Circassians, in addition to one Armenian and one Chechen. 15 persons form the executive of the Democratic Administration. All in all, 13 committees were founded – defense, women, society matters, economy, finances, health, culture, education, communal administration, martyrs, services, diplomacy, and youth&sport. Xalit: The greatest challenge was to win enough women among the non-Kurds for this function in accordance with the gender quota of 40% as agreed. This was due to the fact that among them, so far very few women had been active in the public-political sphere and the question of women's rights had hardly been posed in a serious manner. For several weeks we struggled for a sufficient number of women to be represented in the legislative. Only because 50% of the Kurds in the legislative of the Minbic Democratic Administration were women, was it possible to observe the quota. All: In the face of the war, the displacements and massacres in Syria, and the exploitation of religion or ethnicity, it is important that all ethnic groups of Minbic are sufficiently represented; from the religious point of view all are Sunni. We also have made efforts to successfully let different professions be represented. Youth, students, intellectuals and artists are also among the 134 delegates. How can we even understand the developments in Minbic in the Syrian political perspective? How, according to you, should this new system be assessed? All: These new structures in Minbic were developed on the basis of the idea of the Democratic Nation. According to it, the nation state is rejected and instead all individuals and groups should be enabled to find their place in it. No identity should rule over the other. In practice this means for instance that all languages can be spoken and the free expression of the different cultures are equal to each other. Women's liberation is a central element and pervades all political and social structures; thus we are gradually introducing the co-chair-system of one man and one woman and a gender quota everywhere. Furthermore, life is supposed to be organised ecologically and communally: Private economic gain must not stand over the interests of society and a broad solidarity among each other is important. This concept has been implemented successfully in the three cantons Afrîn, Kobanê and Cizîrê since 2012, but the difference is that here lives a majority of non-Kurds. And this is exactly what is special about Minbic. Square where ISIS executed 545 people. Today children can play here. Picture by Ercan Ayboga. Bozgeyik: All that which we are hearing from the Kurds in recent time sounds so very new and exciting to us. The greatest thing is that we are building something new together and in good cooperation. Even more decisive than theory is practice, because this is what the broad population is looking at. Hopefully we will manage to build a model for the whole of Syria in Minbic. In the face of the enormous suffering this is very important. We are aware of the historic and responsible task we are carrying out. That is why we work a lot, discuss and continuously educate ourselves in academies which we have established. What does Abdullah Öcalan represent in this context, as the one who provided the ideas behind the concept of Democratic Nation? Which role does he play in Minbic? Tarik: Abdullah Öcalan has voiced essential thoughts which place the coexistence of cultures at the centre. The peoples are coming closer at heart. Today Öcalan is not only a political leader of the Kurds, he has earned himself a very special role for Circassians and all others in our region. We can also see this in the fact that women are becoming active in society. What do you think of the role of the Turkish government in the war in Syria? For weeks now the Turkish army has been attacking villages in western Minbic. All: We maintain a good relationship with the population of Turkey. Many of us have lived in Turkey as refugees and a small number of people from Minbic are still there as refugees. Nonetheless, the Turkish government has wronged us for years by supporting ISIS. ISIS is the common enemy of all people and we should focus on them. The attacks of armed groups supported by the Turkish army against villages which were liberated from ISIS taking place now are unacceptable. We invite the Turkish government to come to Minbic and witness themselves what we are establishing here. All parts of society partake, we have established social peace and consensus. There are repeated reports on the YPG/YPJ respectively QSD allegedly conducting ethnic cleansing of non-Kurds, especially Arabs, in Northern Syria. Has something like this taken place in Minbic? Maschi: I can answer this very clearly: no. Everyone out there on the streets of Minbic will confirm this, too. If something like that had happened neither me nor the majority of Arabs would have established the new political structures together with the Kurds and the others. In general, the liberated villages were examined for mines for several days, then all inhabitants were allowed to return. This applies to Kurdish villages, too. Whoever alleges something like this does not know the reality or has something bad in mind. Rather, the opposite is the case, in spite of decades of oppression the Kurds have not answered with nationalism and have truly promoted kinship among Syria's peoples. This is especially evident in Minbic. Last month a demonstration for Abdullah Öcalan took place, in which we and many thousands took part in. Arabs, Kurds, Turkmens and Circassians were marching together.